Today it's time to show off the less staged and put-together side of blogging! Let's laugh together and take a look back at the best photography bloopers from 2017 on Southern Belle in Training. In my earlier years of blogging, I used to try and share blooper photos every few months. There's no reason really why I stopped doing it (I guess as my blog grew and I got busier with sponsored content, that took first priority! ), but I still love looking at the funny outtake photos from time to time, so let's do that again today! 😉 The original blog post that each photo appeared in will be linked by each picture. June 2017: "One Maxi Dress Two Ways: Breezy Daytime Look"
I titled this blog post "Breezy Daytime Look" for a reason! This dress was super fun to let blow in the summer breeze (Melissa and I shot these photos lakeside in Burlington), but at the same time, there were also a lot of fun outtakes, like this one. What even is going on with my hair?! Between the dress and hair... too much to keep hold of! One thing that happens a lot with blogging photography is that the camera is still clicking away even as I'm adjusting poses or moving to a new spot! That's exactly what happened in the photo above! I think I was already over the poses I had done in this spot - ha! December 2017: "Vermont Holiday Look"
September 2017: "Late Summer PR Packages Review." My parents kindly help out with my photography needs for Southern Belle in Training when I'm visiting home in Maine, we're traveling together, or they're here in Vermont and I need a quick Instagram photo or have something come up. I love the fact they're able to help with this! My mom is an artist and photographer (for her job) so her images are usually beautiful. My dad on the other hand.... photographer in training. 🙂 The picture above is one of his outtakes, and the ones following are as well. We sure do have fun when he helps with my blog photos, but let me just say it takes a LOT of effort to get the photos with him that you'll actually see featured in a blog post! July 2017: "I Tried LipSense - My Honest Review!" I shot the photos for this post at home in Maine this summer with my dad... this was a favorite outtake. Man oh man.... haha!! 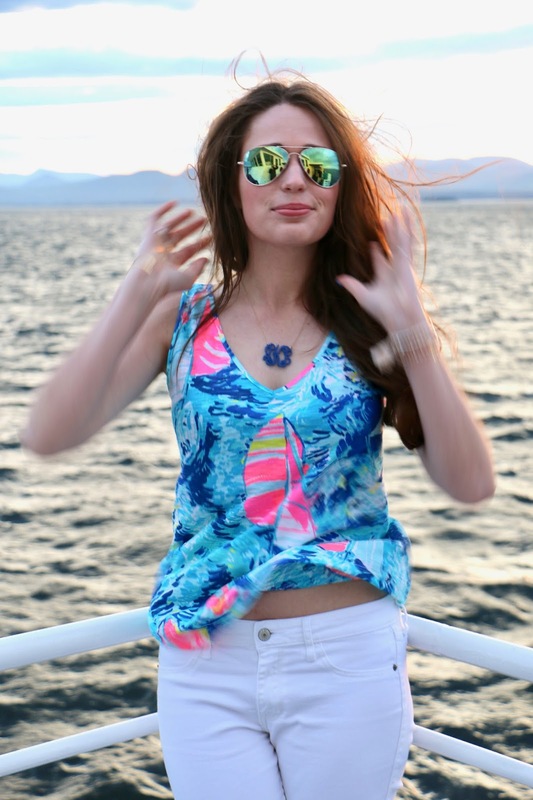 August 2017: "Nautical Lilly Pulitzer Look"
During my dad's summer visit to Vermont, we took a sunset lake cruise one night on Lake Champlain. It provided the perfect backdrop for some blog photos! We did end up getting some that I loved, but with the crazy wind on the boat there were also tons of funny ones of me trying to tame my hair. 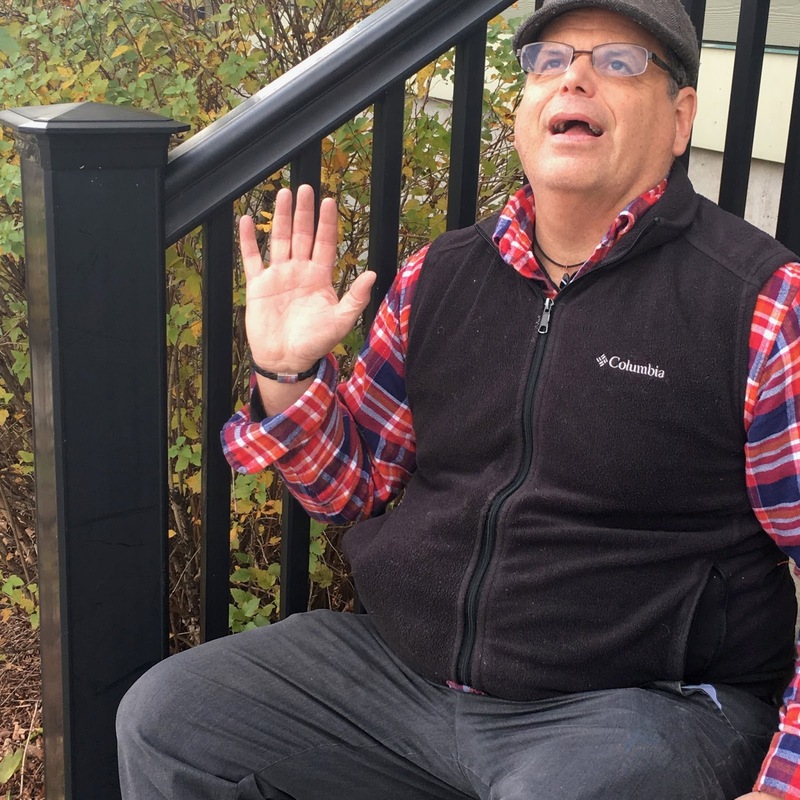 November 2017: "New Must Have Cardigan"
On my dad's fall visit to see me, we ventured across the lake to Plattsburgh, NY. I'd always wanted to do blog photos in their downtown so that was kind of fun. 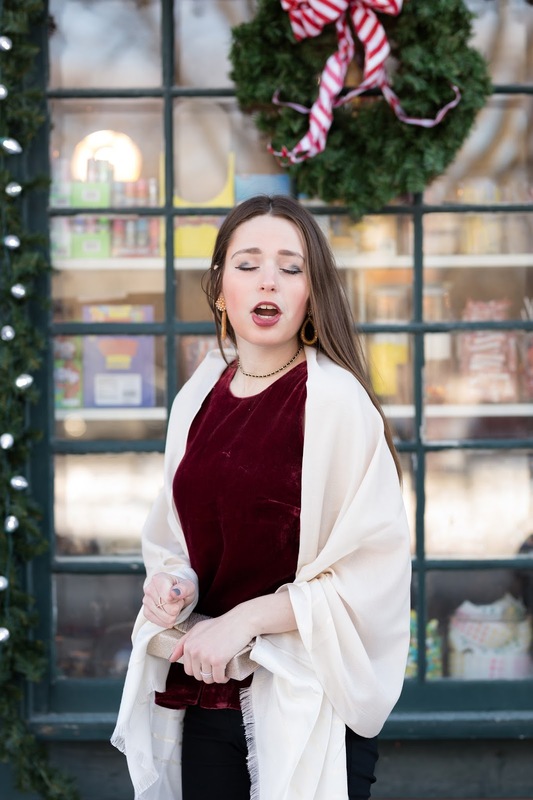 This picture though was my favorite outtake, it reminds me of the iconic scene in Princess Diaries where Princess Mia is being taught how to wave! Hope that you enjoyed my 2017 edition of blogger bloopers!! Wishing you a wonderful start to you weekend as well. TGIF- we made it!! I'm very excited about this weekend for two reasons. One: today it is 50 degrees! Granted it's raining all day... but STILL, that is 60 degrees warmer than it was last weekend in Vermont! (Yes... -10 last weekend.) Secondly, I have tomorrow off! I haven't had any Saturdays off from work since starting my job, minus the couple that I've used PTO for when I've been traveling out-of-state. But I actually have tomorrow off to enjoy to myself. Ahhhh!! I forgot what having a Saturday off looks like. This won't be a weekly happening, but I'm planning to try and really enjoy this weekend. This is such a cute post! I love the photos of your parents -- absolutely adorable! Hahaha! This is just too cute! Love your parents. I love that you shared these! Goes to show how 'real' bloggers really are! I am such a photo bomb so I totally get bloopers. OMG you and your mom look SO similar it's crazy!!! I actually LOVE your beach blooper photos, especially the first! you look stunninggg!! Haha I love those photos of your parents! It always makes me laugh when Andy imitates my poses when I take pictures! Oh my gosh, love these! The ones of your parents are such gems- I have a few test shots of my brother who typically takes my pictures and I find them hilarious! HAHAHA YAAAAS GIRL! I am *such* a fan of blooper posts. You go girl! Haha this is totally adorable! Your parents are the cutest! haha I have been collecting a few outtake photos for my fourth round of bloopers post too! It just goes to show how much there is to do on the back end of a blog! LOL!! These are so good haha! I love that you shared these, so fun! The pictures of your parents totally win this post-they're so adorable! I love how you showed the other side of blogging. Hahaha you still look so cute in spite of your bloopers! I've always loved blooper reels. It shows the reality behind beauty!